Butler Home Improvement’s top-notch bathroom remodeling contractors in Edwardsville work with area clients to improve the quality, efficiency, and value of their homes and businesses. 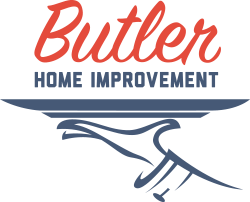 Butler Home Improvements services extend to complete renovation, new flooring and amenities, and enhancing the quality of your bathroom. The veteran contractors at Butler help customers comprehend the attributes, benefits, and possible disadvantages of products to ensure high-caliber bathroom remodeling. It’s your bathroom, so it should be your decision. We’re here to make that happen. Beginning a bathroom remodeling project in Edwardsville takes time, organization, and finances. Fortunately, Edwardsville area contractors like Butler Home Improvement excel in interior and exterior home improvement projects like bathrooms. Our design specialists help homeowners decide on brands and products to ensure their bathroom renovation is successful. Butler Home Improvement is ready and willing to make the most of your next kitchen remodeling, window replacement, deck, and sunspace project. Butler’s long-standing reputation is supported by the projects we’ve completed for our clients. Check out our interior and exterior gallery to view our work. Feel free to contact Butler for a free quote. How much are you willing to spend? Deciding on a budget is difficult when you consider the amount of work that needs to be done to finish a bathroom. Our Edwardsville bathroom remodeling contractors offer free quotes, financing options, and other advice to help homeowners land on a budget. What’s the contractor’s role? Many property choose to remodel their homes by themselves. This is fine if you know what you’re doing, but remember the costs and possible problems that may arise from low-quality work. Edwardsville bathroom remodeling experts meet homeowners in the middle. Who does the bathroom remodeling? Butler Home Improvement consists of qualified interior design professionals. Our track record, associations and accolades, and White Glove Service prove our team is right for the job. What should I do after I remodel my bathroom? Interior remodeling isn’t as seasonal as exterior renovations. When planning one project, go ahead and think of the big picture to further improve the value and quality of your property. Butler offers Handyman Services as well as kitchen remodeling in Edwardsville, IL. What’s the first step? Once you decide to start bathroom remodeling project in Edwardsville, reach out to the experts. Contact Butler Home Improvement or request a free quote to learn more. It’s helpful to ask questions when you begin a bathroom renovation in Edwardsville. For instance, how long will the project take to finish? What if I change my mind halfway through? What if my expenses extend beyond my budget? The remodeling experts at Butler Home Improvement have the answers. For more than two decades, the Butler team has provided clients with hassle-free bathroom remodeling in Edwardsville, IL. We know the ins and outs of projects, their costs, the strain to homeowners, and how to make the most of the process. We focus on giving our clients advice and no-strings-attached quotes to make sure your bathroom renovation in Edwardsville is a success.